Just like ample sunshine and panoramic views of the Cascades, fire is a natural part of our Central Oregon ecosystems. 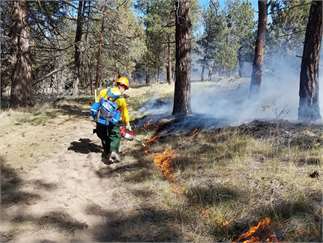 Nicole Strong, assistant professor of forestry and natural resources with Oregon State University Extension Service, will describe the different ways our Central Oregon forest ecosystems have adapted to and depend on fire. Nicole will discuss how forest and wildfire management during the past 100 years has impacted the health and resilience of forests today —and look at some examples of community-based, collaborative forest restoration taking place across our region. Seating is limited and RSVP is required. RSVP’s will open April 10th.